A delegation of Hamas Movement has met on Friday with the Lebanese Information Minister Ramzi Jarih in his office in Beirut. The delegation included the representative of the movement in Lebanon Ali Baraka, Hamas information official in Lebanon Raafat Marra and a member of Hamas political leadership in Lebanon Mashhour Abdel Halim. Baraka stated that they have discussed recent Palestinian developments particularly Israel’s escalated Judaization policy. US Secretary of State John Kerry's plan is totally biased in favor of Israeli occupation's position that denies the right of return, he said, stressing Palestinian people's adherence to their right of return. 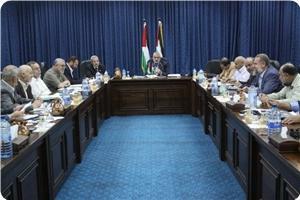 The meeting also discussed Palestinian refugees' conditions in Lebanese refugee camps. “We have briefed Lebanon's information minister about Hamas's initiative issued on the 28th of March that stressed the movement's keenness on Lebanese security”, Ali Baraka said, confirming that Palestinians can only be a part of Lebanon's stability. He expressed his rejection and condemnation to the use of Palestinian refugee camps as tools to target Lebanese security. For his part, Lebanon's Information Minister expressed his support to Palestinian issues particularly the Palestinian prisoners' issue, emphasizing that the Palestinian cause remains the central issue for all Arab countries. Member of Hamas's political bureau Mousa Abu Marzouk said that the most important step which the Palestinians must take in order to face the challenges is to stop the security cooperation with the Israeli occupation. In remarks on his facebook page on Friday, Abu Marzouk stated that Israel's threat to withhold the Palestinian Authority's funds has been counteracted by the Arabs' decision to pay the salaries of Palestinian civil servants in the West Bank. He expressed his belief that the Palestinian Authority (PA) is now able to use this Arab financial support to encounter Israel's intended punitive measures against it and end its security cooperation with Israel. "However, the most important step which the Palestinians must take is to cease the security coordination [with Israel] because most of the salaries being withheld go to the very oversized security institution in the West Bank," the Hamas official added. The Hamas official also urged the PA to respond to the bulk of the Palestinian people who reject the resumption of the peace talks with the Israeli occupation and support the decision it had taken earlier to join international organizations. 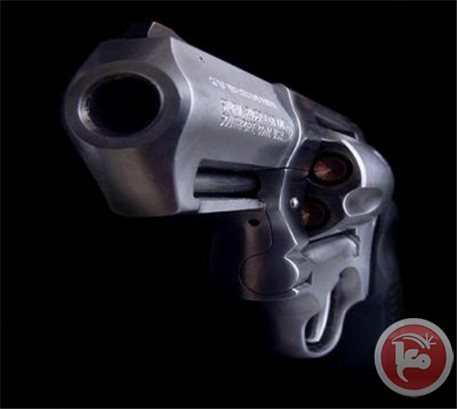 Unidentified gunmen early Saturday opened fire at a lawyer's home in the northern West Bank, Palestinian security sources said. Palestinian security sources told Ma'an the assailants also set tires ablaze in front of the house of lawyer Jamal Arar in the village of Magharat al-Daba south of Qalqiliya. The suspects fled the scene without being identified, the sources said. The marathon is held under the banner "Right to Movement" in order to highlight Israeli obstacles to freedom of movement in the occupied Palestinian territories. 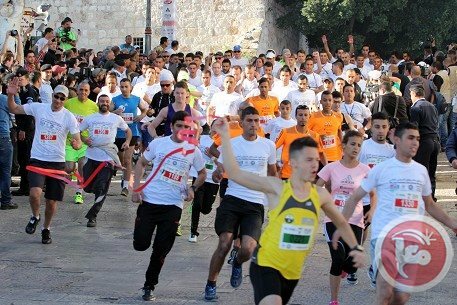 "By God's blessing, I pronounce the start of the second international Palestinian marathon in the city of Bethlehem," Baboun said. Israeli forces prevented Palestinians from using the speakers at the Bilal Bin Rabah mosque at Rachel's Tomb near Aida refugee camp in order to help participants with directions on the course nor to play music. From there, participants ran beside Duheisha refugee camp to the village of al-Khader west of Bethlehem, before turning back at an Israeli checkpoint near the historic Solomon's Pools archaeological site. "Nader Al-Masri is another victim of the 'separation policy', the over-reaching, arbitrary and vague decision that, every day, inflicts harm on tens of thousands of Palestinians seeking only to live a full and normal life," Gisha said in a statement on Tuesday. 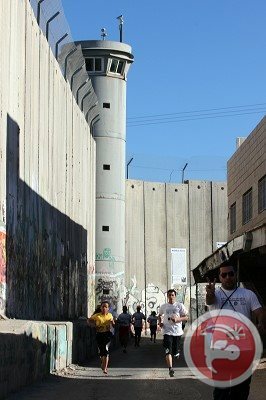 Palestine and Jordan submitted a resolution to the UNESCO Executive Board to send a fact-finding commission to investigate the situation of heritage sites in Jerusalem and in other Palestinian towns and to submit its detailed report to the World heritage committee that will be held in Doha, Qatar at the end of June. The decision came during the meeting of the UNESCO Executive Board that took place in Paris on Thursday. New supportive attitudes from European countries such as England, France, Italy, Austria and Spain, were expressed in the meeting, except The United States which rejected the decision. 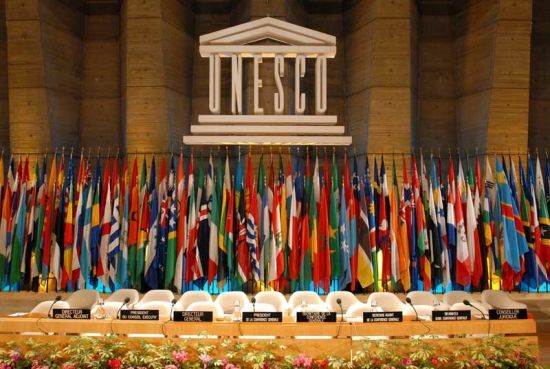 Palestine and Jordan called through the UNESCO Executive Board and the World heritage committee, the Israeli authorities to stop their violations and illegal measures in Jerusalem and Palestine. The United Nations Secretary-General, Ban Ki-moon, officially signed documents that allow the Palestinians' accession to 10 United Nations international conventions and treaties. Israel Channel 10 said the Palestinians are planning to join the Fourth Geneva Convention to protect the civilians in armed struggles and the The Hague Convention that deals with the International laws. In a related context, the channel added, the issue of the prisoners was an essential topic in the agenda of the third negotiation meeting that was held Thursday afternoon, as Israel proposed to release some of the prisoners on a condition to deport them from their homes, a proposal that was totally rejected by the Palestinians. Bethlehem's second annual marathon was underway early Friday, with some 3,500 participants from Palestine and around the world participating. Bethlehem governor Abdel Fatah Hamayel and Mayor Vera Baboun welcomed the runners in Manger Square. Police blocked off routes throughout the city, and Red Crescent medics supervised runners' progress. Last year about 500 runners took part in different legs of the race. On Tuesday, the Israeli High Court of Justice turned down an appeal by the human rights group Gisha on behalf of Gaza runner Nadir al-Masri who was denied entry to the West Bank to compete in the marathon. Referring to the reconciliation file and the Palestinian elections, al-Ghusein pointed out that Fatah and Abass’s actions were made for media purposes. “They have no real will to achieve the reconciliation especially in light of negotiations with Israel.” He said. “How could we conduct the elections under two governments and authorities? Before elections, we have to form a government and stop the political arrests against resistance factions in the West Bank.” He wondered. 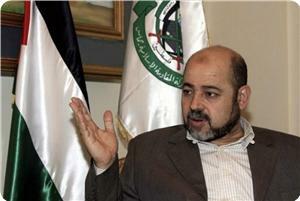 Al-Ghusein called on Egyptian authorities to open Rafah crossing permanently. When asked: will the government in Gaza deal with al-Sisi in case he won the Egyptian election? he responded , “we were always dealing with the Egyptian intelligence during Mubarak, Mursi’s rule or even now. We do this for the interest of our people and issue; we do not interfere in the Egyptian’s interior events because the stability of Egypt concerns us.”. 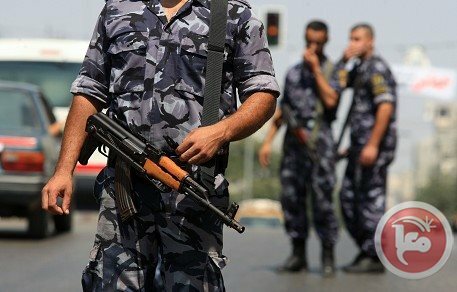 A mentally disabled man stabbed and injured two men in Khan Younis in the southern Gaza Strip, witnesses said. One of the victims sustained critical wounds and the other was moderately injured. They were taken to Nasser Hospital in Khan Younis for treatment. Bystanders managed to neutralize the attacker before police arrived. Member of Hamas's political bureau Mousa Abu Marzouk called for reviewing the reconciliation process and resuming the inter-Palestinian talks from the point they have stopped at. 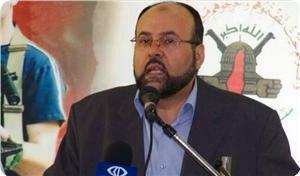 In remarks on his facebook page, Abu Marzouk said that Fatah leaders keep talking that the mission of the reconciliation committee is only confined to convincing the their rivals to hold elections and form a national unity government, while ignoring the Cairo and Doha agreements and the need to implement them. He stressed that what had been agreed upon is not confined to forming a government or holding elections, but it includes the files of the Palestine liberation organization (PLO), freedoms, security and social reconciliation. "Some consider that any talk outside the framework of elections and forming a government means that Hamas is not ready for the reconciliation, especially if the talk was about the PLO and political arrests," the Hamas official underlined. Hamas Movement has marked in Lebanon the 66th anniversary of the Deir Yassin massacre, which claimed the lives of a large number of native citizens west of Jerusalem in April 1948. The movement's representative in Lebanon Ali Baraka said in a statement on Wednesday that Deir Yassin massacre proves the criminal image of Israeli occupation and reveals its ruthless and arrogant nature, stressing the need to prosecute Israeli continued massacres since the Palestinian Nakba in 1948. The Palestinian people will not give up their rights despite Israeli crimes and massacres, Baraka added, stressing the Palestinian adherence to resistance option. He called on the Palestine Liberation Organization leadership to stop negotiations and security coordination with the Israeli occupation authorities that only serve Israeli interests and provide a cover for its violations. Confronting the occupation requires a Palestinian national unity based on resistance option and Palestinian constants and legitimate rights, he added. 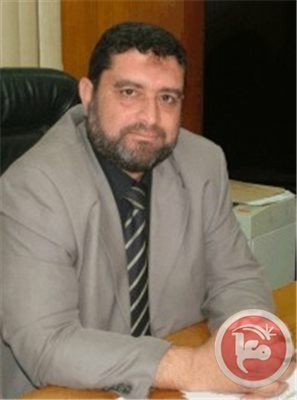 Tahsin al-Saqqa, director of marketing department in the ministry of Agriculture in Gaza, denied what the West Australian paper reported about banning the exporting of Australian live cattle to Gaza under the pretext of " mistreating ". Al-Saqqa said to ALRAY Wednesday "the information that published on the west Australian newspaper about stopping exporting a ship with 10,000 at Fremantle because cattle mistreating in Gaza is not true". AlSaqqa made clear that Gaza buys the Australian cattle from the Israeli occupation, explaining that a footage of Israeli company's worker released showing them while shocking the cattle with electricity in order to kill them. The Department of Agriculture, Fisheries and Forestry in Australia revealed that it had not approved consignments of cattle for Gaza since November when it began investigating allegations raised in the Israeli media. 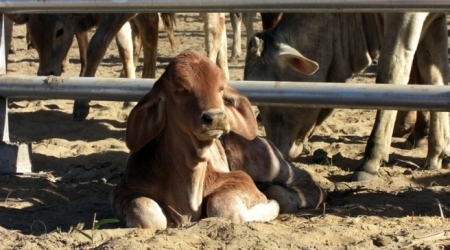 Logistics Support System in Australia said ,"the release of nine cattle from the supply chain was "unacceptable" and it suspended exports to the Gaza facility" , andt abused cattle could be identified by their ear tags. The allegations are serious and information obtained during the investigation is considered when assessing any application from any exporter to send livestock to Gaza," A Department of Agriculture spokesman said. Recently, all exporters to Israel should react with additional conditions to ensure livestock are unloaded in accordance with international animal welfare standards. Gaza government has called on the international community to intervene immediately to put an end to Palestinian detainees' plight in Israeli jails. The government expressed in a statement on Tuesday after its weekly meeting its total support for Palestinian detainees' legitimate demands especially ending solitary confinement policy and Israeli inhuman violations against them. 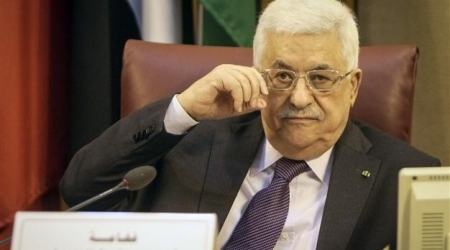 Regarding PA demand to join 15 UN agencies, the government called on PA Chairman Mahmoud Abbas to join all UN agencies and treaties to accelerate prosecution of the occupation. 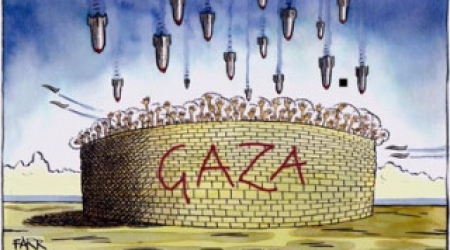 On the other hand, the government condemned the Israeli continued aggression on Gaza Strip that led to several injuries and destruction of buildings and other facilities, describing it a desperate attempt to cover up the Israeli internal crisis and to keep the besieged Strip under threat. Concerning Palestinian reconciliation file, Gaza government stressed its readiness to achieve national unity and reconciliation, welcoming the visit of a delegation sent by Mahmoud Abbas to Gaza to discuss reconciliation implementation. 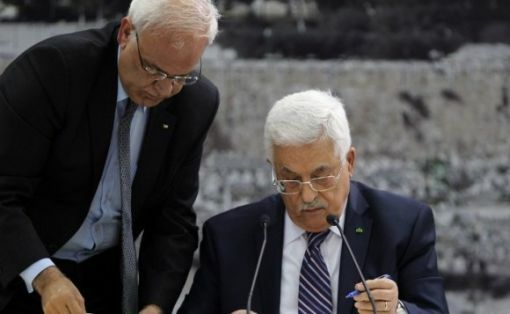 The government also called on Abbas not to comply with Israeli pressures and to stop the negotiation process that only provided a cover to Israeli crimes along the past 20 years. Shifting to another issue, the statement stressed the importance of neutralizing the Yarmouk refugee camp in the Syrian capital in order to lift the siege imposed on it for nine months, appreciating UNRWA and human rights institutions' role in distributing aid supplies to the besieged refugees. In another context, the government strongly condemned the killing of Palestinians in the armed clashes that broke out in Mieh Mieh Palestinian refugee camp in Lebanon, stressing the importance of avoiding any violence in the Palestinian refugee camps. The statement praised UNRWA's Director of Operations in the Gaza Strip Robert Turner's statements in which he called for lifting Gaza siege and pressuring Israel to allow entry of construction materials in addition to the swift opening of Rafah crossing. The statement concluded by calling on UNRWA to bear its responsibility towards the difficult humanitarian situation in the besieged Strip. 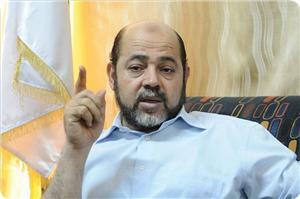 Gaza City Mayor Rafiq Makki said Tuesday that the minister of local governance had accepted his resignation. 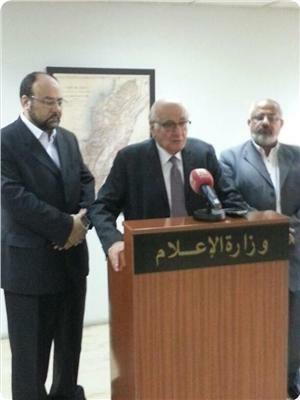 Makki told Ma'an that Muhammad al-Farrah accepted the resignation that he submitted in November 2013. Since November, Makki has been serving as an interim mayor, he said. A new deputy mayor, Nizar Hijazi, will be taking over the position on Sunday. Makki resigned in November for what he called "personal and health-related" reasons. 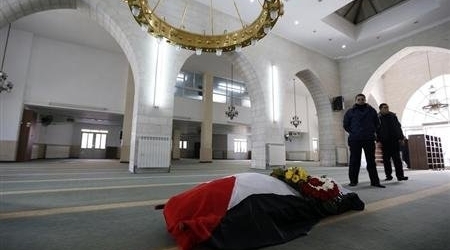 (Reuters) - The Palestinian ambassador to Prague who died in a blast in January was most likely killed by a decades-old charge of Semtex plastic explosive concealed in a book, a newspaper reported on Tuesday citing a police investigator. Police had decided Jamal al-Jamal was not assassinated, but had simply unwittingly opening a book booby-trapped years earlier, the source told daily newspaper Mlada Fronta Dnes. Palestinian Communication Minister( in Ramallah) Safa Nasser has accused Israel of tightening the noose around the local communication sector in the besieged Gaza Strip. "Israel has confiscated equipment belonging to mobile phone operator Wataniya Telecom," Nasser told Anadolu Agency on Monday. She said that Israeli authorities had suspended an earlier decision to allow Palestinian firms to provide third-generation (3G) mobile telecommunications technology. The latest restriction is part of a raft of Israel-imposed penalties against the Palestinian Authority (PA) following a recent decision by PA President Mahmoud Abbas to sign 15 applications for Palestinian membership in various U.N. agencies and conventions. 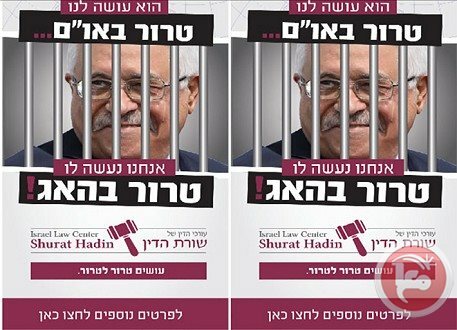 Abbas signed the applications last week in response to an Israeli refusal to release a fourth batch of Palestinian prisoners despite earlier pledges to do so. According to Nasser, the new Israeli restrictions have already cost Palestinians some $200 million in losses. She said that her ministry had asked the International Telecommunication Union to pressure Israel to reverse its restrictions on the Palestinian telecom sector. 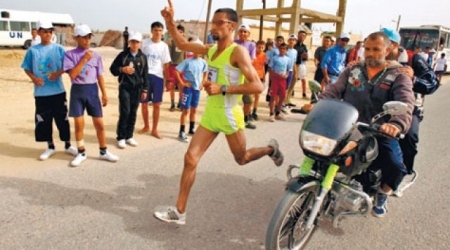 Nader al-Masri, 34, with 14 years of running under his belt, was one of only four athletes to represent the Palestinian Authority in the 2008 Beijing Olympics . The next year, he took part in a competition in Bahrain. But this time, Israel is refusing to let him out of the Hamas-controlled enclave and into the West Bank. "I don’t have any security background or anything. I'm an athlete, I represent my country, go out, come back, and that's it," al-Masri told Army Radio. "I'm 34. I only have two, three more years before I retire," he added. 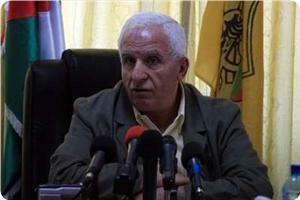 Gaza premier Ismail Haneyya received a phone call from Azzam Al-Ahmed, the head of Fatah movement’s delegation to reconciliation talks, on Monday. The call was about the expected visit by a delegation sent by Mahmoud Abbas, PA chief and Fatah leader, to Gaza to discuss reconciliation. A terse statement for the Gaza government said that the premier welcomed the visit out of keenness on national unity and national cause. 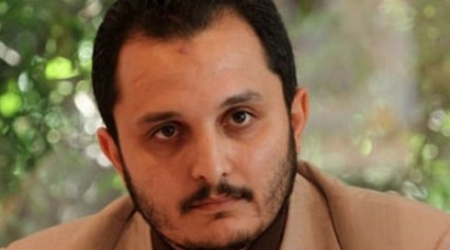 Ihab Al-Ghussain, the government’s spokesman, said that preparations would be made later on for the visit. Abbas decided to send a five-member delegation to Gaza to discuss with Hamas movement means of forging reconciliation including the formation of a new unity government and organizing general elections.